The original video of the rally, the one The Daily Show uses is from Tucker Carlson Tonight. At 44:10 Tucker Carlson Tonight video from Good News Daily youtube channel there is booing from the crowd when Trump mentions Hillary Clinton, along with Bill Clinton, and Barack and Michelle Obama, and their unexpected campaign trip to Michigan. At 3:38 in the Daily Show youtube video you can clearly hear that they’ve edited the clip from the Tucker Carlson show, manipulating it to make it seem as if the crowd was vocally chanting “lock her up” before Trump says “that play is great before the election, now we don’t care”. If you watch the original video, you can easily discern that Trump was referring to the unexpected campaign trip to Michigan by his opponent Hillary, along with Barack and Michelle Obama, as the “great play” obviously to win over Michigan. 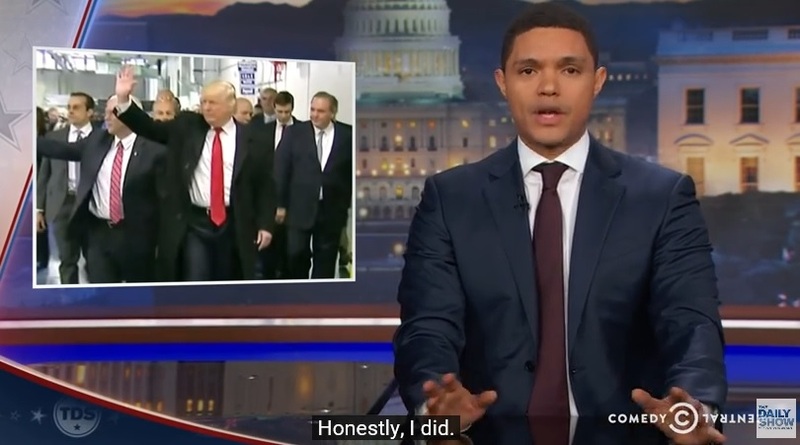 However, Trevor Noah deceives his audience with this edited audio clip to make it seem as if Trump was tricking his supporters.